To celebrate Eatyourcity.ca being #2 on Urbanspoon - Thanks for the love everyone! (And we really were looking for an excuse to eat out), on a hot summer night, we head to Bistro La Persaud for dinner, with hopes that we'll have time to hit up the Fringe after. Just a stone throws away from the Faculty St Jean, this restaurant uses the mall's arresting and bold red, metal and glass architecture and sunken courtyard to its advantage. The sunken courtyard is framed by the malls circular shape - lending it an amphitheater feel with bright red patio umbrellas to shade the embossed metal tables and black wicker chairs. 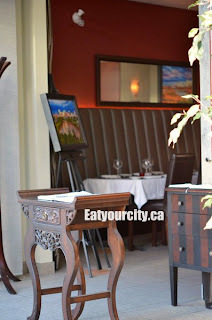 Seating inside has dark tables with white linen framed against deep red walls. Service was bilingual and a bit spotty, as they were short staffed with the hostess busing tables alongside the one harried waiter. It took a little while for us to order drinks as we chose to sit in a small glassed in hallway leading from the restaurant to the patio as it was a bit more sheltered from the gusting wind and still allowed in plenty of sunlight. Unfortunately, we we're in the direct line of sight. Once the staff remembered us, things went a bit more smoothly. The waiter was so flustered he told us they didn't have a cocktails menu - which we discovered after the meal they did - they had a variety of cocktails on their lunch menu. Well, they were catering a Fringe Theater event on site, and being super short staffed, we forgave some of the glitches. 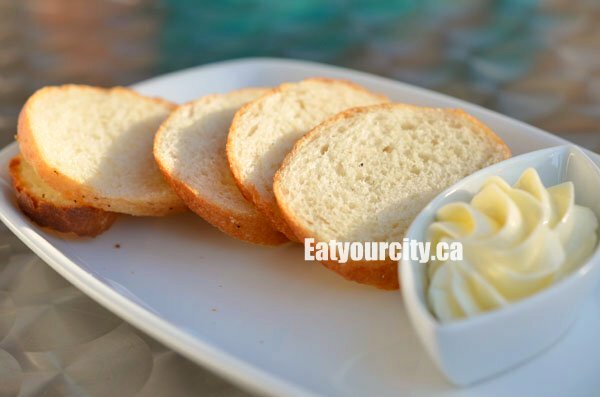 We started off with a small platter of freshly baked bread with enough unsalted creamy butter to make any butter lover smile. It was served with a small sipping cup of creamy avocado and mint soup (au gratis). 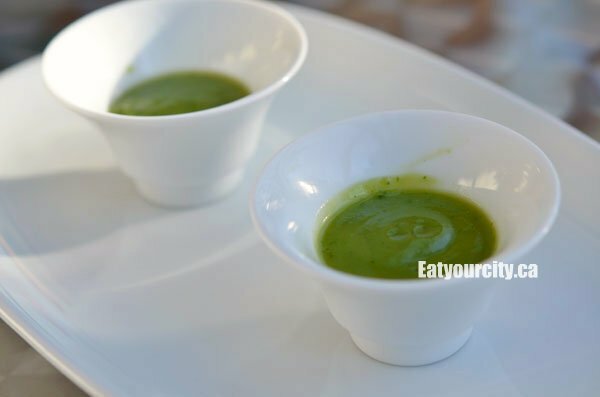 Refreshing and surprisingly light despite the richness imparted form the ripe avocado. We watched some patrons pour it onto their bread to enjoy. Yummy. was a super creamy smooth whipped pate of duck, pheasant, chicken and pork liver flavored gently with cognac and Madagascar pepper. It was served with a caramelized shallot jam (yum! ), apple jelly (light and refreshing) and white grape jelly (the black current gastrique it was supposed to come with they ran out of I guess). The pate was delicious with the duck flavor coming out the strongest. Spread on sweet raincoast crisps embedded with cranberries, a vegetable wheat crisp or some of their fresh baguettes. 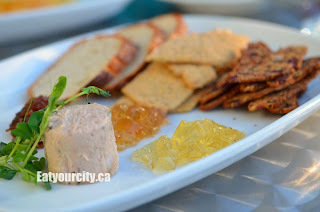 It was delicious despite the fact we had ordered the Duck Rilletts (slow cooked shredded duck with toasted sliced baguette and blood orange gastrique), but was served the House pate instead...a tasty mistake! 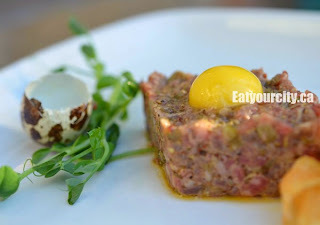 The finely minced meat was seasoned with diced shallots, capers, cornichon, lots of little mustard seeds and topped with a quail's egg. 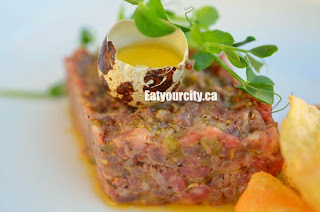 The tartare was quite acidic and we likened it to our first "pickled" tartare, as the capers and mustard seeds masked the delicate sweetness of the tartare, yet it was tasty none the less... especially after you poke the quail's yolk to add a rich velvetiness to the affair. It was oddly served with thinly shaved potato chips instead of traditional toasted bread or crackers. It was difficult to spread the tartare on the airy crisps, so we used most of the bread and crackers from our charcuterie house pate platter instead. I love lamb, so I went with the Alberta lamb. 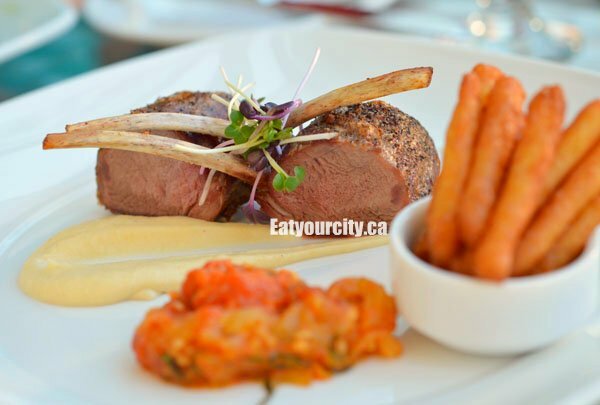 It was a spring rack of lamb olive oil poached and finished by roasting. Though I ordered it rare, it came out closer to well done, but was still tender and moist. It came with a side of smoked potato croquet (think fried mashed skinny potato fries) and light roasted tomato and fresh mint confit. The separate components tasted great on their own, though as a whole, there was no unifying flavor to tie the dishes together... other than each element was tasty and held up well on their own. The pan seared breast of pheasant was cooked to perfection. The skin was delightfully crispy and almost devoid of fat, with the meat moist and flavorful. 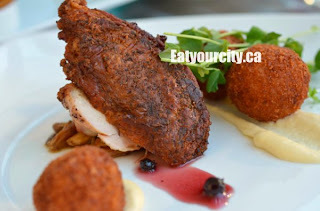 It was served with mildly sweet blood orange arinchini and rosemary macerated Saskatoon berries sauce which paired well - an interplay between the savory and sweet. The breast was resting atop of some sauteed caramelized shimiji mushrooms. A well thought out and executed dish. Nom. And before you think we got away with scrimping on our vegetables, both entrees came with a little pot full of steam-roasted vegetables. 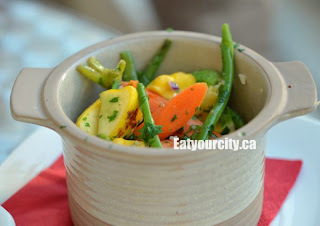 Fresh baby carrots, green beans baby zucchini and yellow squash was cooked to a tender crisp and scented lightly with diced garlic, butter and parsley. Simple, healthy and quite filling as each person got a little pot of vegetables to finish. You always finish your vegetables right.. right? Despite being quite full from dinner... the vegetables did us in! We stubbornly persevered and ordered desserts. 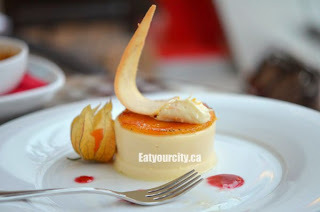 I was torn between the house made lemon curd on a shortbread crust topped with citrus crème fraiche and walnut thuile and the Peach and Berry Pavlova with peach slices and a mountain of seasonal berries I saw other patrons ordering, but I stuck to my guns and was not disappointed with their crème brule. The sugar topping was a touch on the thick side, but after the sugar was a richly creamy and indulgent interior studded with vanilla specks. 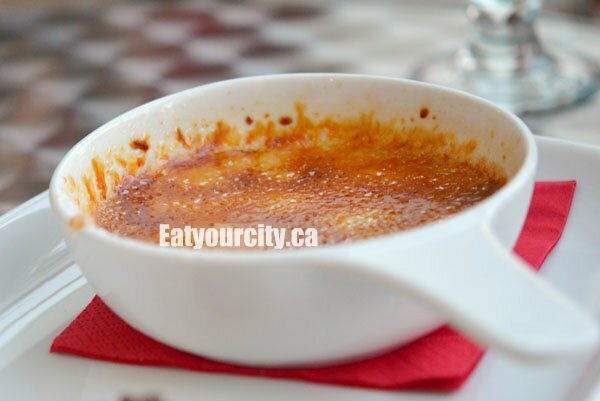 The crème brule was also served with a guanaja chocolate ganache on a bed of raspberry compote and speckled lightly with chopped chocolate bits. 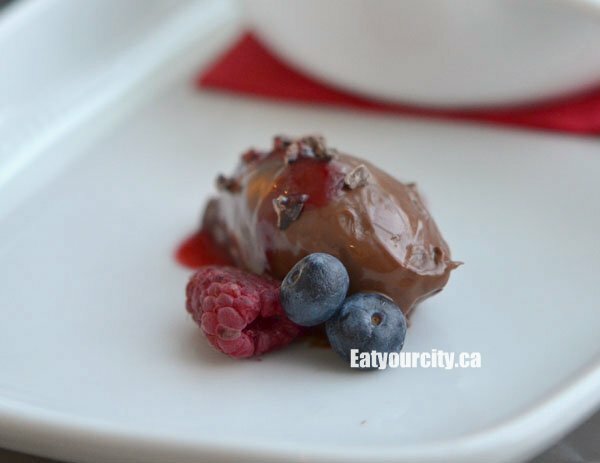 This unassuming simple blob of ganache is a wonderful hit of smooth rich chocolate yummmmy. The tart raspberry compote helped keep the ganache from getting too sweet as you savored each silky bite. Mmmmmm. Mine. I'm soooo not sharing... Nom! Though the regular menu had a limoncello panna cotta, we noticed the Fringe Theater dinner special had a pineapple panna cotta. After a quick check in the kitchen, we were enjoying a smooth panna cotta gelatin with a bright hit of fresh pineapple. Our favorite was the caramelized thin slice of pineapple that had a thin disk of candied sugar underneath it, along with the small blob of pineapple laced crème fraiche. The little dots of raspberry or strawberry syrup and super ripe gooseberry added in a spot of color and additional sweetness, but the panna cotta was the star! Despite the unfortunate service glitches due Bistro La Persaud being short staffed the night we dropped by for supper, the waitstaff staunchly remained cheerful, polite and helpful - dashing off to the kitchen to clarify questions, apologizing when they realized there was a few tables sitting just off of the main line of sight. Given a bit more time for Executive Chef Emmanuel David (of culinary Team Canada fame) to iron out the staffing issues and continue to create well thought out cohesive dishes... Bistro La Persaud will be a gem Edmonton will treasure.